We take a hands-on, focused approach to bring your vision to life. The furniture we represent is best in class created by the world’s top manufacturers. We have the skill to complete a project on time! Creating furniture solutions to fit your budget. First of all, you’ll like us. We get it. It’s all about service. When you call, we pick up the phone. When there’s a challenge, we have a solution. 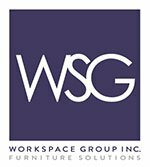 As a full-service contract office furniture company, we’ve been creating inspiring workspaces for nearly two decades. And each one is installed through impeccable service and attention to detail. We take a consultative approach with our clients from day one, evaluating their cultural, operational and business needs. Our design services are tailored to each project: we can partner directly with clients on furniture selection and aesthetics or follow the lead on projects developed by your architects and designers. Our dedicated account team has deep experience in each stage of your project: we are obsessed with organization, communication and collaboration. We’re with you every step of the way. Our experienced team of installers are renown for their technical expertise and have the capability to respond to our clients’ installation requirements. Plus, we have our own fleet! Our team will ensure your relocation is organized, deadlines are met. We don’t just drop off the furniture and forget about you! We are by your side for add-ons, on-going moves and changes.